I'm writing again about the BBC mysteries that we love and taking this time to introduce a new one: Endeavour. To go back to the beginning: in the 1990s in Britain, a detective show began based on a popular series of novels. The series was titled, Morse, and turned out to be extremely popular---in large part for its great acting, fine mysteries and top notch writing. The lead was fashioned as one of the last of the "English gentlemen detectives": highly educated, just a touch snobby, lover of opera, art, and all things British! The setting was Oxford, England and the stories were just wonderful. Morse's asst. was Sgt. Robbie Lewis. We watched all the Morse shows and, gratefully, then found the Inspector Lewis series, a spin off from the first, which began in 2006. Lewis and his assistant, James Hathaway, became the second series that we watched from beginning to end and enjoyed just as much, if not more, than the Morse series. We finally finished the Lewis series with great lamenting for the end of these great, great mysteries. 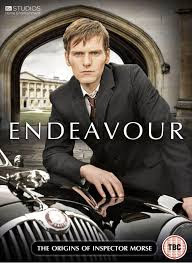 But, soon after we were surprised and thrilled to discover the third in the series: Endeavour, a prequel to the first two--with the main character being Morse (Endeavour Morse) when he is just starting out as a young detective. 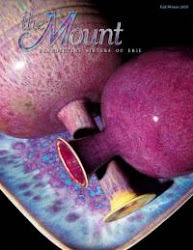 Kudos to the Erie County Library for carrying the DVDs of all three series. The first name of Morse was never mentioned throughout the series, until the very last show. Now "Endeavour" is known by all his fans! Morse and Robbie Lewis in the Inspector Morse mysteries.